This device quickly and accurately measures the range of motion for all major joints of the body. Ideal for difficult-to-measure cervical rotation, lateral flexion of the head, and anterior-posterior cervical flexion. It is durably constructed of one piece of clear acrylic plexi-glass and features a built-in leveling bubble to ensure accuracy. Degree markings are red and black for easy reading. 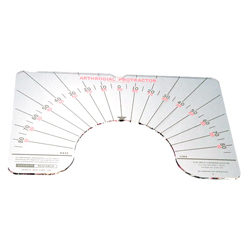 Includes two 180° opposing scales in 5° increments. Latex free. 12in H x 18in W (30cm x 46cm).